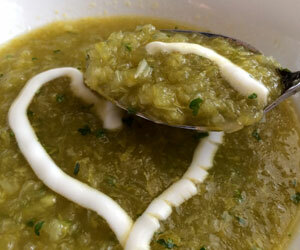 If you love celery as much as I do, you are going to love this simple soup. The recipe was born after my holiday ravioli making. You see, I only use the celery leaves in my ravioli recipe. I’m left with an overabundance of celery…its soup season and I’m on a health kick…sooooo, here ya go. P.S. My husband loves it too. Place sliced celery, chicken stock and onion into a large soup pot. Bring to a boil. Reduce heat and simmer, partially covered, for 30 minutes. Remove from heat to cool. While soup is cooling, make Chimichurri Sauce. Note: Use the remaining Chimichurri on grilled meats. Remove onion from the soup pot and discard. Puree soup in blender in batches. Note: I like to leave a little texture to my soup while doing this. Return pureed soup to soup pot. Stir in 2 tablespoons of your Chimichurri Sauce. Heat soup and serve with a dollop of sour cream on top. Chimichurri Sauce makes a wonderful accompaniment to grilled meats…it really brings your taste buds to life!! Place fresh herbs, jalapeno and garlic into your food processor. Pulse until chopped. Remove herb mixture to a small mixing bowl and stir in red wine vinegar, olive oil, salt and pepper.